Runic Games founders Travis Baldree and Eric Schaefer have started a new studio, Double Damage Games, and now they’re gearing up for their first release, the Elite-inspired Rebel Galaxy. Don’t let the on-screen prompts fool you: an Xbox version is only a “maybe” at this time. The classic Elite is like the Carl Sagan of video games, inspiring generations that came after it to pursue the wonders that lie in outer space. Of course, Carl Sagan has less aliens and laser cannons, so Elite kind of trumps him in a couple of major ways. Double Damage Games’ debut release, Rebel Galaxy, looks to take elements of several well-known classic game series — including Star Control and, in the way much of the combat seems to run, even a dose of Pirates! — and combine them with a Firefly-esque universe concept to bring players a brand-new space combat and diplomacy game that is equal parts creativity and nostalgia, all tied together with a few lens flares and anachronistic outer space sound effects because even in a vacuum you can’t have a laser without some zippy singe sound to go with it. In addition to the game’s more obvious influences, Baldree and Schaefer also claim a huge amount of inspiration from the sea battle sequences in Assassin’s Creed: Black Flag, considered by many to be the best part of that game (other than the sea shanties, of course.) What this means is that Rebel Galaxy isn’t your typical interstellar dogfight game: instead, you command a massive war ship. You can take control of individual turrets, or smaller ships, as you please, but your primary concern is your giant hulk of space junk, and keeping it safe at all costs. The game is aiming for an action slant rather than the tactical or strategy gameplay typically seen in the genre, so even when diplomacy goes well, rest assured a firefight is always around the next corner. As of yet Rebel Galaxy has no set release date, with “some time in 2015” being all we really have, though Double Damage Games intends to keep updates flowing as they bring the game closer to completion. 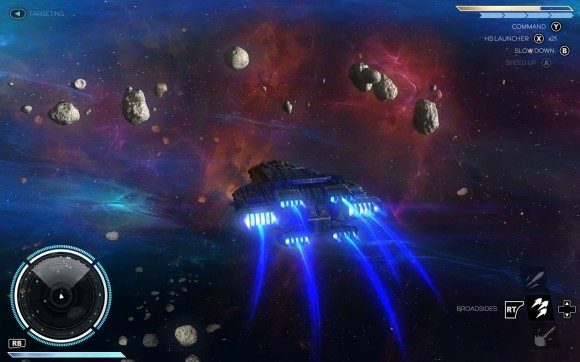 With releases planned for Steam (though no specification of PC, Mac, or Linux support) and the PS4, with the Xbox One being a definite maybe on the horizon, Rebel Galaxy has a long way to go, but looks like it will be worth keeping an eye on.